In addition to construction of infrastructure for education, NJSI has been providing other forms of support to schools. Likewise, on 29th December 2017, NJSI sponsored science lab equipments, white boards, audio-visual devices, tables and chairs for computer learning at Maha Laxmi School, Lalitpur. 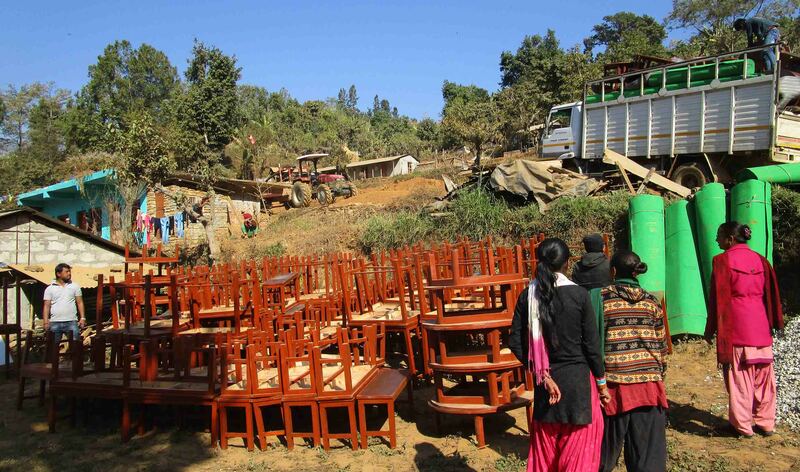 Similarly, Balsikshya Higher Secondary School, located at Sindhupalchowk district was provided with twenty chairs for office use. Both schools had received relief support during emergency phase of earthquake in 2015. NJSI had then supplied CGI sheets, school kits, text books, stationary, furniture, trampoline etc. The students and the school authorities happily conveyed gesture of thanks to NJSI and the sponsor, Manos Unidas. Another women’s activity center was handed over at Khadichaur, Sindhupalchowk on 30th December 2017. The center consists of two rooms and a washroom, similar to other multipurpose centers built by NJSI. Center serves for about 100 women belonging to varied ethnic background. The center will be used for social meetings, adult education, training and community building programs. NJSI had conducted a program on para-legal activity on 22nd December 2017 at the center. 39 people had enthusiastically participated to learn about human rights, women rights, child rights and dalit rights. In contrary to their assumption, the activity coordinators reported the women’s group to be very energetic, interactive and well aware about social issues and rights. Most of them could write their name and sign. They had previously formed several groups to initiate practice of communal saving and economic enhancement. With the formation of building, they have joined the groups to form a larger one called Chimling Bensi Mahila Samuha. 65 women participated in the handover ceremony to express their gratitude to NJSI. The center was built with the sponsorship from Xavier Network. 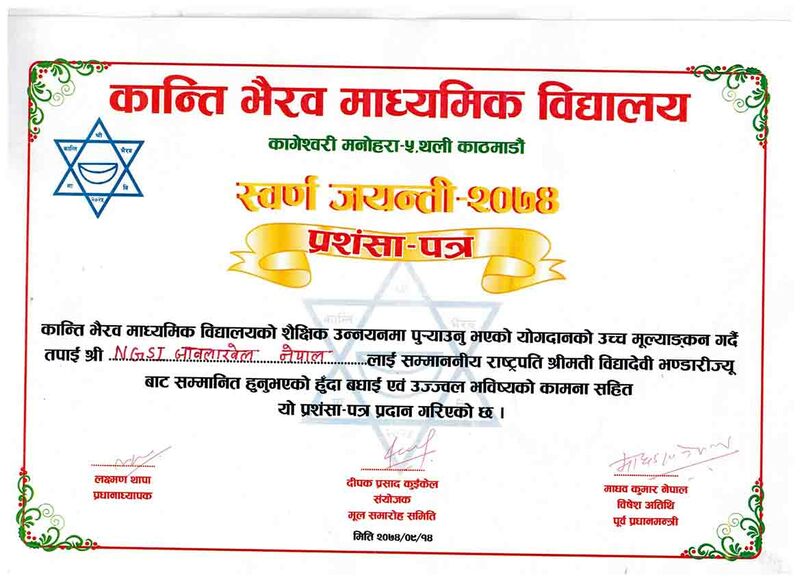 NJSI was invited to celebrate golden jubilee of Kanti Bhairav Secondary School based in Thali, Kathmandu on 29th December, 2017. The program acknowledged and appreciated organizations who had supported the school during the emergency phase of devastating earthquake in 2015. So, the chief guest of the program, Her Excellency President of Nepal, Bidya Devi Bandari presented the appreciation certificate to NJSI and few other organizations in presence of former Prime Minister Mr. Madav Kumar Nepal and other political party representatives. The program was short and presented students’ performances and congratulating speech from Her Excellency and other distinguished guests. A major focus of NJSI has been to rehabilitate education in earthquake affected areas. NJSI has completed building ten schools in Gorkha districts enabling 1110 students to attain education. Most of them are primary level schools and students come from poor economic background. NJSI recently provided furniture package to these schools. The package comprised of a white board, two tables, five ECD tables, six sets of desks and benches, 24/24 m carpet and 4 chairs. We are positive that better furnishing will help in better operation and management of school. Also, it allows students to engage and learn in comfortable environment. The schools supported are Barahi Primary School, Jalmukhi Primary School, Shiv Primary School, Jana Sakti Primary School, Mul Devi School, Sapta Kanya School, Badri Dada School, Sorpani Samudayik School, Siddhartha School and Thani Primary School. 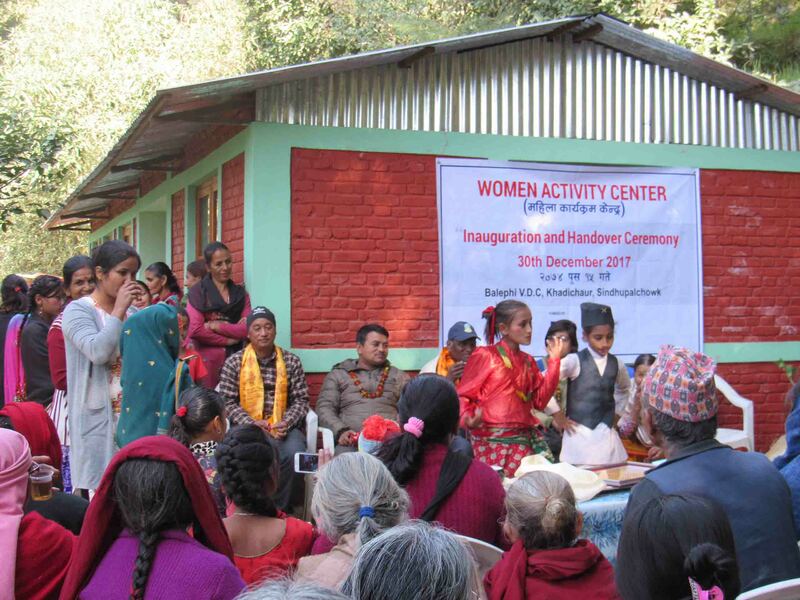 On 9th December, the women’s activity center at Kunta, Kavrepalanchowk was handed over to the Kali Devi women’s group. The center has two rooms: a big hall for larger meets and a smaller one for office work, and a toilet. The beneficiaries were very happy and thankful to NJSI and the donor, Mission Achen. The group is comprised of one hundred and six women of 18-70 years age group and diverse ethnic background. Previously disseminated into several groups, they have now come together to work for better community. They have initiated ‘saving and credit’ co-operative as the first step of their communal work. They aspire to promote women empowerment through skill development and income generating training. Before the construction of the center, they used to have meetings and other activities under the open sky in an empty land. They were constrained to sustain with limited resources and individual contributions. Establishing a center of their own was crucial to further advance the group. The beautiful multipurpose hall will be used to conduct regular meetings, awareness programs, vocational training, cultural and other activities. The National Reconstruction Authority (NRA) was established by the government of Nepal to look after and coordinate the earthquake relief and reconstruction activities after the 2015 devastating earthquake. On 27th January, 2017 NRA conducted a program in completion of 2 years of their establishment. The program was organized to give information to all regarding the works they have done so far. 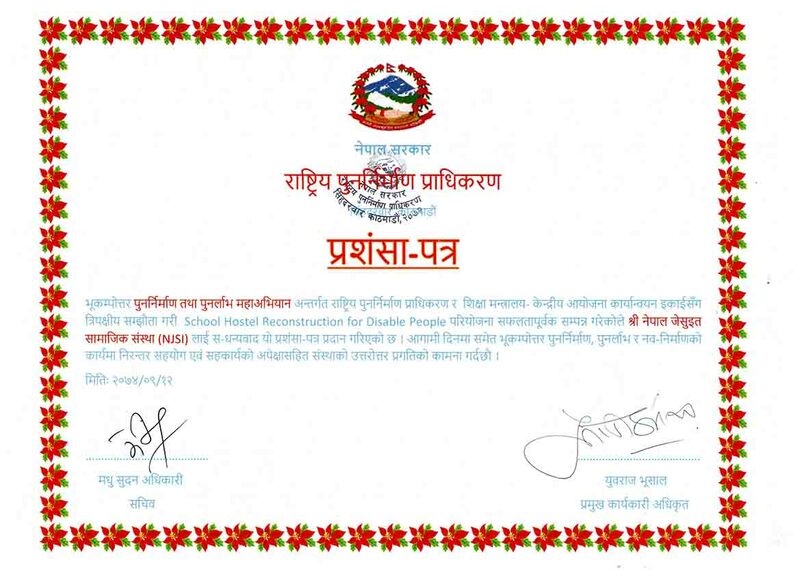 And at the end, the selected organizations were given the appreciation certificate for their intervention in earthquake relief and reconstruction. NRA held NJSI’s contribution and invited us to receive the appreciation letter during the function. NJSI was appreciated, among other things, specifically for the construction of residential school facilities for disabled people. 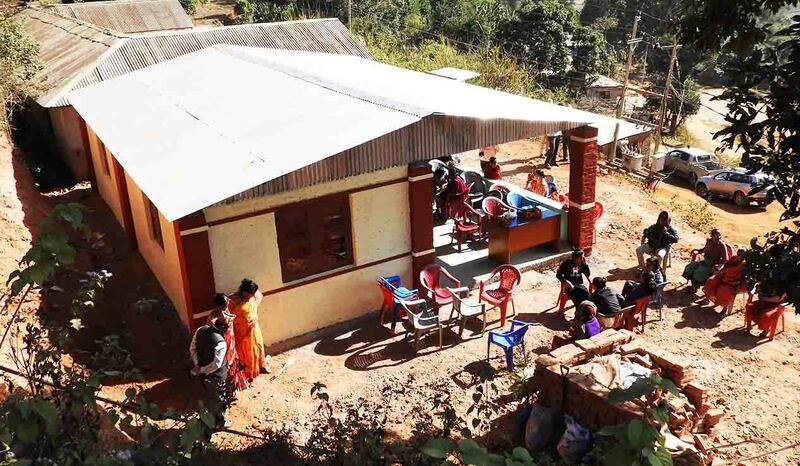 So far, NJSI has constructed four hostels for special children alone; three in Nuwakot, one in Sindhupalchowk and few are under construction in Kavre. Each hostel is designed to accommodate twenty special children (10 boys and 10 girls). Each has two bedrooms, one for girls and other for boys, one kitchen, and one study/activity room. The hostel has two toilets and two bathrooms, separated for boys and girls. This project is financed by Missionszentrale der Franziskaner and supported by Xavier network in Nuwakot and Amici Dei Bambini funded the one in Sindhupalchowk. All four hostels have been handed over and the children are already residing in them.